Canadian born, Regina based painter Sean William Randall’s dynamic oeuvre depicts a man whose brilliant color sensibility coupled with incisive awareness has made him one of Canada’s most interesting painters working today. In 1992 Randall left his career as an architect to dedicate himself to painting; this brash confidence is evinced in his work where one minute he demonstrates a profound love for Canadian landscape painting, conjuring comparisons to the enchanting Ivan Eyre, and the next moment setting the tradition on fire by painting flaming wreckage streaking across the pastel prairie sky. His work often invokes meta-cycles concerning image inundation and the way these images function in our subconscious and mediate our experiences as citizens of the 21st century. In this latest series, Randall plays with notions of reality and familiarity as being constructs, informed by images from our past which play on our memory. He realizes this concept by depicting a setting which perhaps feels familiar though is decidedly unplaceable. 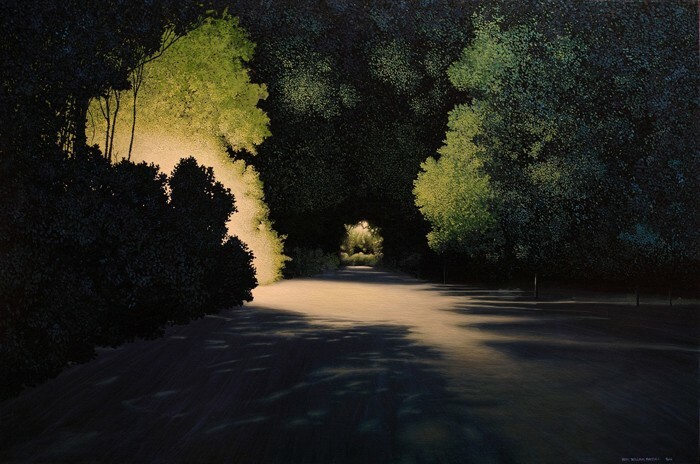 Palpable tension is created within the image as the viewer is left to wonder whether we are situated on a lit path or floating down a gentle stream towards or away from, an unknown light source. Randall’s painting practice acknowledges that it is dictated by the use of modern technology while concurrently striving to be its antithesis through analyzing the concepts and producing work in a slow medium like painting. His work leaves us with a question relevant to our modern existence – can we still differentiate between which memories are our own and which have been crafted for us, and is there a difference? Ian Tan Art Gallery is located right on South Granville Street. Collectively, the numerous galleries on this street give it the name “The Gallery Mile.” The Gallery Mile extends from Granville Island to West 16th Avenue. This trendy location allows the Ian Tan Art Gallery to display and sell contemporary art to their countless number of happy clients. Directions from Granville Island to Ian Tan Art Gallery Vancouver BC, V6H 3G3. Head west on Anderson St toward Cartwright St. Turn left to stay on Anderson St. Turn left to stay on Anderson St. Use the right lane to turn left at the 1st cross street onto W 4th Ave. Turn right onto Hemlock St (signs for Granville Bridge N). Turn right onto W 7th Ave. Turn left onto Granville St/BC-99 S. Destination will be on the right. Directions from Downtown Vancouver to Ian Tan Art Gallery Vancouver BC, V6H 3G3. Head northeast on Seymour St toward Dunsmuir St/BC-1A/BC-99A N. Turn left onto Dunsmuir St/BC-1A/BC-99A N. Turn left onto Howe St. Keep left to continue on BC-99 S. Destination will be on the left. Powered by Coronation Internet Marketing Ltd.